Socktober is here once again. It's the month that hits you, if you actually think you are going to knit any gifts for the holidays you better get cracking now. Welcome to the 8th month in the Socks For All Seasons Pattern club! I decided to look ahead to the changing seasons and embrace the cooling weather with a cardigan-like buttoned sock. As the seasons change and the nights grow longer we need small comforts to protect us from the evening chill. 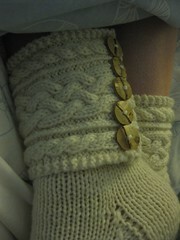 This pair starts with the cuff, then stitches are picked up for the foot. 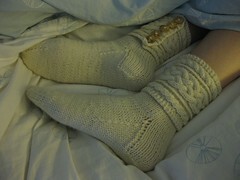 You can even knit the foot in a contrasting yarn if you’d like. When completed, real buttons function like a cardigan sweater for added warmth. 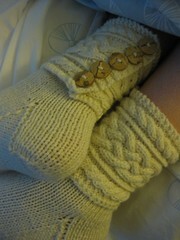 This pattern also includes some hot drink recipes for you to explore while knitting your own pair of extra thick socks. Foot circumference: 7 (8, 9) inches 17.5 (20, 23 cm) unstretched. Will stretch to fit 8 (9, 10) inches 20 (23, 25.5 cm). Needles: 1 set US #3/3.25mm straight or circular needles (CUFF) AND 1 set US #4/3.5mm (SOCK) 32” circular needles (magic loop), 2 sets of 24” circulars or double pointed needles, or size to get gauge. Yarn: Worsted-weight yarn that gives you proper gauge. Sample shown: Dream in Color Classy [100% Superwash Wool; 250 yd per 4 oz skein]; color: Crying Dove: 1 (2, 2) skeins. Sample is a medium which used 300 yards. Notions: Tapestry needle, cable needle, 10 - 3/4” buttons. Those are beautiful. And unique - never seen socks like that before! Could totally see myself wearing those... Great design! 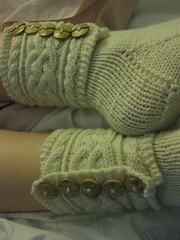 High-button socks - I love them! They remind me of a lazy winter Saturday where I'd be knitting, drinking tea and listening to the fire crackle...Love them! Yay for worsted weight socks! 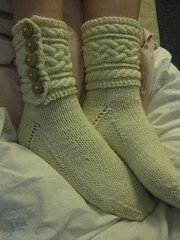 I last knit big fat socks a couple winters ago, when it snowed and snowed. Cozy and quick.